Do you hold internal workplace inspections? When many construction business leaders think about the word ‘inspection’, there is the connotation of state authorities marching around a site identifying weaknesses and potentially putting a halt on proceedings. As no construction boss wants to be landed with penalties and court action, it is important that they launch their own series of inspections. In fact, inspections of various natures and degrees can actively pinpoint fall hazards before any member of the team gets hurt, or before state authorities find issues. According to Safe Work Australia, falls from a height continue to be one of the most common workplace hazards, up with being hit by an object, lifting heavy objects and repetitive movements. Based on its Work-Related Injuries and Fatalities involving a Fall from Height document, a total of 232 people lost their lives in a fall incident between 2003 and 2011. This represents 11 per cent of all workplace deaths during this period. 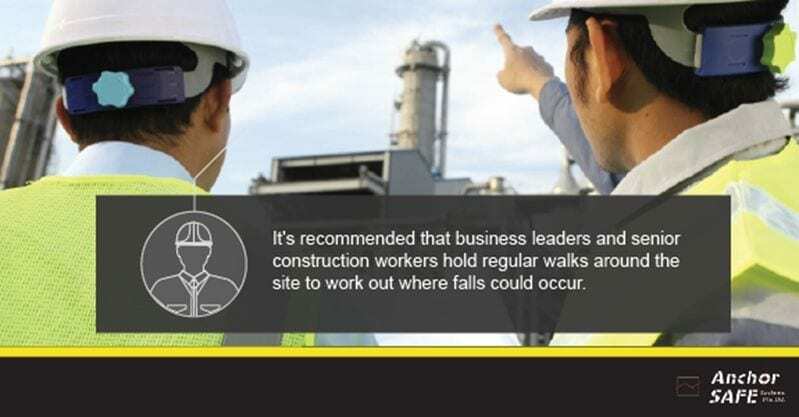 As such, it’s recommended that business leaders and senior construction workers hold regular walks around the site to work out where falls could occur. This could include talking to different members of the team to assess their potential concerns. With this in mind, what should feature as part of an internal inspection? Hazard identification is a key way to prevent workplace accidents. Depending on the size of the construction, it is likely that workers could be operating on different levels. This presents a number of workplace fall hazards, including workers slipping or tripping between levels. Should this risk be identified, Anchor Safe Systems have the equipment to help. Through our leading range of guardrail and walkway systems, we can deliver superior barrier protection across elevated surfaces. Additionally, the non-slip nature of our walkways system provide another layer of safety when working at heights. There are many situations that require workers to operate at or near edges. While it should be avoided where possible, there are many situations that require workers to operate at or near edges. Whether this is around open floors, working platforms or roofs, edge protection should be a serious consideration for any business leader. Again, this is where we can be of assistance. With heavy duty roof anchor points available, we are able to support safe roof access and tailored fall protection equipment around edges. As a mainstay in the Australian construction industry for the past 35 years, we understand the challenges and processes associated with running a safe, but productive site. Reach out to us today to find how we can be a part of your next internal inspection program.